Recently, one vacant building--the original Hudson Orphan Asylum, whose history is woven deep into the history of Hudson--bit the dust. A few months earlier, 211 Warren Street was determined to be beyond saving, and it too was demolished. Not something one expects to happen in a city that purportedly values its historic architecture. Both buildings had been vacant for more than ten years, and in both cases the owners had some intended plan for the building's restoration. In 2012, the old orphanage was to become part of a transitional housing facility known as "Galvan Quarters." That plan was abandoned when it met with opposition from the community, and in 2014, a new plan was presented to the Planning Board that involved converting the building into ten studio apartments. The second plan was never pursued, and, after five more years of standing vacant, the building was determined to be beyond salvation and demolished in the interest of public safety. The situation with 211 Warren Street was not dissimilar. The building had been vacant for a few years before it was damaged by fire in 2010. The current owner acquired the building in 2011 and, in March 2015, the plan to preserve and restore the facade of the building and construct a new passive building behind it was approved by the Historic Preservation Commission and the Planning Board. More than three years passed before work began on the building, and when it did, a foundation collapse, likely exacerbated by persistent heavy rains, made the preservation of the facade impossible, and the entire building had to be demolished. 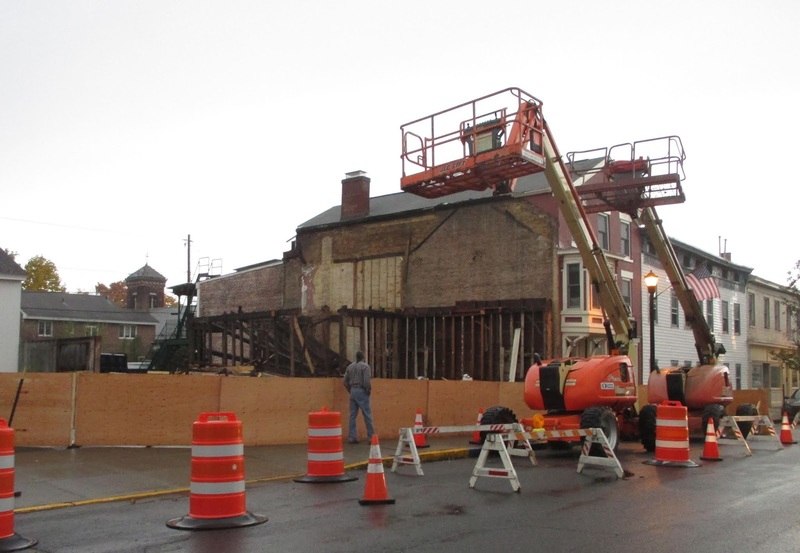 Preventing the loss of Hudson's authentic architectural fabric is not mentioned in the "Legislative Findings" of the vacant buildings law adopted in September 2018. The law instead stresses the detrimental effects of abandoned buildings on the immediate neighborhood: "It is the finding of the Common Council that buildings which remain vacant, with access points boarded over, are unsightly, unsafe and have a negative effect on their surroundings." It seems, however, that the law should discourage the instances of demolition by neglect that are still happening in Hudson, sixteen years after the City declared, "as a matter of public policy, that the protection, enhancement, and perpetuation of landmarks and historic districts are necessary to promote the economic, cultural, educational, and general welfare of of the public," by adopting the preservation ordinance (Chapter 169 of the city code). But how effective is the vacant buildings law? In December, three months after the law was enacted, Gossips learned that only one building had been registered. It turns out that the code enforcement office is relying on citizens to report vacant buildings in their neighborhoods. Last week, Bill Huston FOILed the list of buildings currently registered, according to the law, as vacant. He shared the information he received with Gossips. There were seventeen buildings on the list. 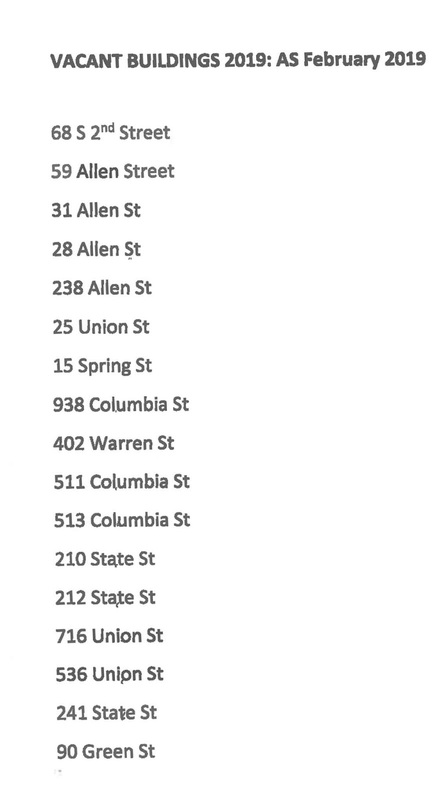 Two vacant buildings that I knew had been reported were not on the list: 250 Allen Street and 17 Prospect Avenue. Questioned about this, Haigh acknowledged that the buildings had been inadvertently left out and assured me they had been added. With those buildings added, the current total is nineteen. It certainly seems that there are more than nineteen buildings standing empty and unused in Hudson. 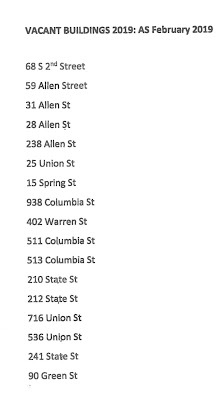 If you are aware of a vacant building that is not on the list, it should be reported to the code enforcement office: hudsonceo@cityofhudson.org. If the City has established a mechanism for collecting the fines on these buildings is the next question to be explored. As I have said many times, the Historic Preservation Committee (so-called) abandoned its adherence to the law (when our current mayor was then running the preservation committee) when handing over its preservation duties to the code enforcement office. It so ironic that Hudson, with a reputation for progressivism has become a Trumpian hotbed of transactionalism. I don't see the Pocketbook Factory on the list. I have fixed up a lot of old decrepit buildings and if you ask me, a lot of what is considered beyond salvation could be repaired, it really depends on how you do it. 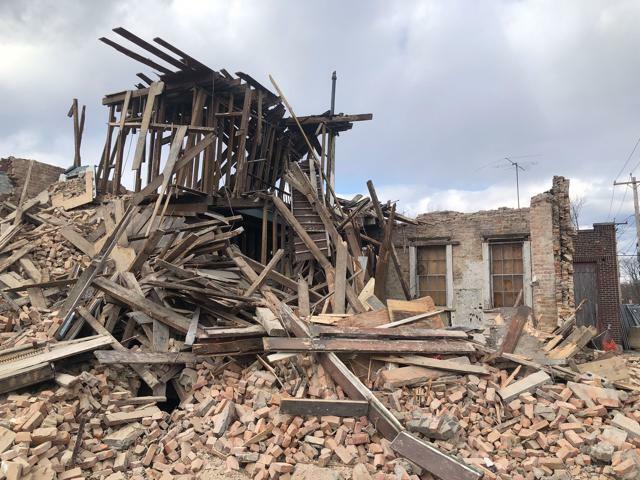 You certainly can't remove 50% of a foundation from under a 200 year old house held together with pegs and old cut nails and expect it to just hang there on a couple of poles for months while you get around to pouring a new foundation under it. And how can you say a solid brick structure that required a wrecking ball to knock it down couldn't be fixed. I think our experts are lacking in expertise when it comes to these old buildings. Once you knock it down, it's gone forever, so perhaps more patience and analysis should be applied in the future. The City's Historic Preservation law is quite good and should protect these historic buildings from both active demolition and demolition by neglect -- but it has to be enforced. The pocket book factory is NOT a vacant building in the same catagory .. it is a preserved building that has been cared for and protected for decades . the stewardship of Eleanor Ambos with all of her buildings is exemplary . I regret she did not buy more buildings like the one that has been demolished . Her roofs are sound the foundations solid and the grounds clean and secure . Just because they are not utilized in the way Hudsonians might consider useful . she has defied the odds and her buildings still stand as testaments of 19th century history . They are there to be admired just as they are ! great thinking! wouldn't it be wonderful if every building in the city were such a treat for the eyes... YET VACANT. A well-preserved, lifeless city. Please.